MANSFIELD, Mass. – The Mansfield boys’ and girls’ basketball teams both celebrated senior nights with victories on Monday night in the Albertini Gym and both advanced to the finals of the 2016 Round Ball Classic. The boys pulled away in the second half to roll past Weymouth 69-42, while the girls used a strong finish to get past Walpole 51-39. Although Weymouth came into the game with just one win on the season, Mansfield could expect to be challenged, as the Wildcats are led by former Franklin coach Dean O’Connor and even just one year in have already taken on some of his trademark intensity. The Hornets mixed and matched the lineup with junior Sam Goldberg sidelined with injury and with Vaughan making sure that his seniors got plenty of time on the court. Kyle Swansburg scored five of his team-high 14 points in the opening quarter and junior Christian Weber scored six, all on drives to the basket. “When he’s going to the hoop and Matt [Ehrlich] complements him going to the hoop and we can score inside out then I think it makes a big difference,” said Vaughan about Weber’s contributions. Weymouth shocked the Hornets by hanging around through the first quarter. The Wildcats scored 15 points, led by Adrian Quinn’s five. The problem for Weymouth was trying to keep that output going over four quarters. Mansfield scored another 16 points in the second with Phil Vigeant scoring five points including a put back on a missed free throw that extended the lead to 22-17. Matt Ehrlich added five in the quarter as well, three on a layup plus the foul and another bucket that pushed the Hornets lead to its largest of the first half, 11. Weymouth scored the final four points of the half to stay within single digits at the break, but Mansfield broke the game wide open in the third. Leading 37-31, the Hornets went on a 13-2 run to close out the quarter and build a comfortable edge heading to the fourth. Ehrlich (eight points) started the run with a layup and a free throw then Swansburg scored over Weymouth’s 6-foot-9 center Julian Mincey and hit a pair from the line. Evan Christo scored to make it 46-31 and Tyler Boulter scored on an offensive rebound. After a Weymouth hoop, Vigeant (seven points) scored again to close the quarter. If there was any thought that the Wildcats may be able to make it a game in the fourth quarter, Mansfield ended those fears early. Boulter buried a three-pointer, followed by another shot from deep by Max Boen and then Boulter took the ball strong to the rim. After Swansburg hit a pair of free throws to make it 61-41, Mansfield emptied its bench to give debuts to younger players. Mansfield will face Cohasset in the Round Ball Classic final on Thursday and Vaughan said that the team still has plenty to work on as it looks ahead to the tournament. The final score made it seem a comfortable win, but with just fewer than three minutes remaining in the game, Kelly Fogarty’s fifth three-pointer of the game had brought Walpole back within two at 41-39. Momentum was with the visitors but the Hornets regrouped and closed the game with 10-0 run that started with Meg Hill being left open on an inbound play under the basket for her first points of the night. Then in transition Jen Peel added her sixth assist of the night to Juliana Newell (10 points) for an easy layup and the lead was quickly back to six points. Hill had been quiet for most of the game but she pulled down a big defensive rebound and scored in the paint to build the lead to 47-39. Peel and Anna Chiarolanza each made two from the line to seal the victory. Despite starting with an unusual lineup thanks to senior night, the Hornets jumped in front early. Mansfield outscored the Rebels 16-6 in the first quarter, led by Caroline Maher’s five points. The lead grew to 11 by halftime with Peel (six points) adding four in the second and Jackie Carchedi and Jen Kemp each knocking down jumpers. But Walpole dominated the third quarter and came all the way back to tie the game. Newell scored four of her 10 in the quarter but Fogarty nailed two threes, Melanie Weber collected an offensive rebound and scored, Emma Flynn banked home a three and Courtney Brigham scored in the paint to even things up at 31-31. Mansfield scored the final four of the third to get the lead back and in the fourth quarter turned to Maher to hold off the Walpole charge. The senior guard scored six in the fourth, including a banked floater on an offensive rebound and a layup on the break. In the end, Mansfield had enough to get the win and stay within touching distance of one of the high seeds in the upcoming Div. 1 South tournament. The Hornets will face Dartmouth on Thursday in the Round Ball Classic before taking on Attleboro on Monday to decide the winner of the Kelley-Rex division. Attleboro, 45 @ Dartmouth, 58 – Final – Berlyns Abraham led the Bombardiers with 12 points and five boards while Lucas Boucicaut added 11 points and Jake Dunkley chipped in with 10 points and five rebounds. Foxboro, 53 vs. Marlborough, 54 – Final – Marlboro converted two free throws with 12.9 seconds to play to take the lead and the win. Senior Alex DuBrow finished with a team-high 18 points while classmate Jason Procaccini added 15 points for the Warriors. Franklin, 74 vs. Brighton, 83 – Final – Tim Prunier scored a team-high 22 points and was named to the Comcast/Arbella All Tournament team. Paul Mahon added 15 points, Connor Goldstein scored 13 points and Kevin Gill finished with 11 points. Mansfield, 69 vs. Weymouth, 42 – Final – Mansfield was led by senior Kyle Swansburg, who scored 14 points. Tyler Boulter added 12 points and Matt Ehrlich had eight for the Hornets, who broke the game open with a 13-2 run to close out the third quarter. 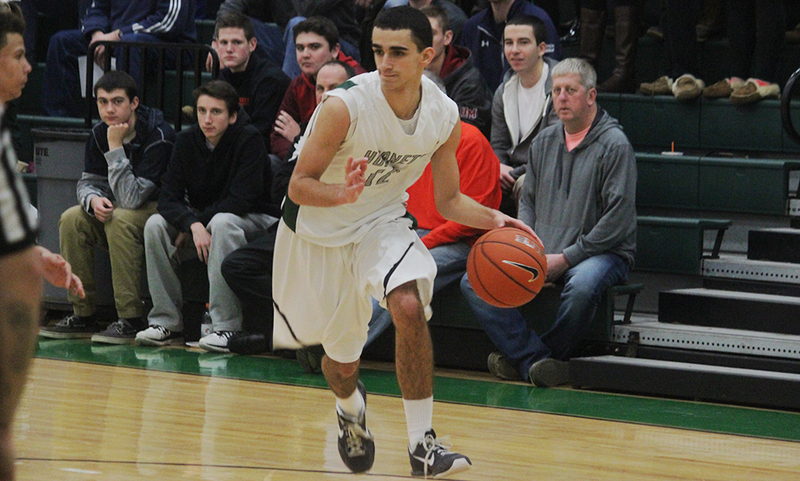 The Hornets, who had 13 players score on Monday, will face Cohasset in the Round Ball Classic final on Thursday. Milford, 54 vs. Lexington, 40 – Final – A strong second half helped Milford turn a one point lead at halftime into a double-digit win. Dwight Anderson notched a double-double with 15 points and 10 rebounds while sophomore Kayden Kelley scored 10 points and hauled in 16 rebounds for a double-double as well. Zach Tamagni chipped in with 13 points. Milford advances to the finals of the 1st Annual Scarlet Hawks Classic to play Tantasqua at 7:00 on Tuesday. North Attleboro, 62 @ Bishop Feehan, 60 – Final – With just over two minutes to play, Ridge Olsen drained a three as the shot clock expired to give the Rocketeers a 58-57 lead. With a minute to play, Mario Bresko got to the rim to go up 60-57. North Attleboro hit a pair of three throws down the stretch to close the game and hand Feehan its first loss of the season. Olsen finished with 17 points and Bresko had 15 points while junior Brent Doherty scored a team-high 19 points. Oliver Ames, 60 vs. Cardinal Spellman, 64 – Final – Junior Dylan Mahoney netted a team-high 15 points while classmate Carter Evin added 14 points and Nick Welch finished with 13 points. Canton, 53 vs. Norton, 37 – Final – Emma Murphy led the Bulldogs with a team-high 14 points, Meg Hunter added 11 points and Hannah Jerrier chipped in with 10 points. Foxboro, 69 vs. Ursuline Academy, 36 – Final – Ashley Sampson led the way with 12 points and Shannon Smally chipped in with nine points for the Warriors. Foxboro will play Hanover on Tuesday night at 6:30 in the tournament finals. 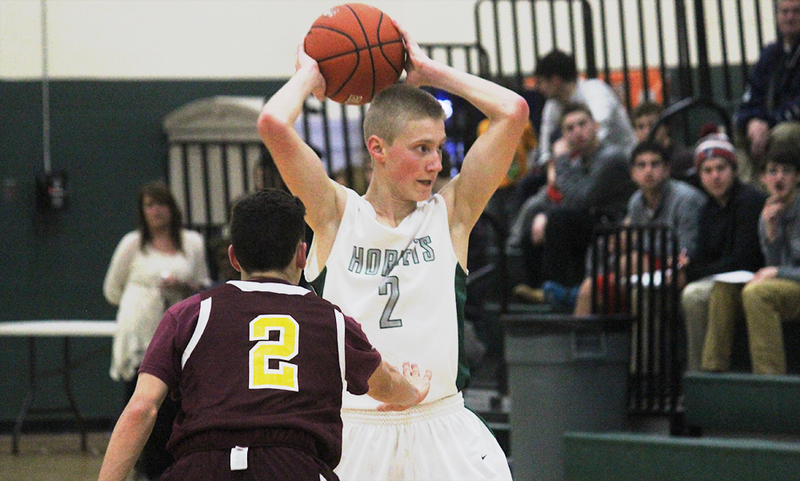 Mansfield, 51 vs. Walpole, 39 – Final – The Hornets finished the game on a 10-0 run to pull out the win. Caroline Maher led Mansfield with 11 points, including six in the fourth. Juliana Newell added 10 for the Hornets while Jen Peel had six points and six assists. Mansfield will play Dartmouth in the final on Thursday. North Attleboro, 40 vs. Bishop Feehan, 50 – Final – The Rocketeers led Feehan 20-18 at the half. Emily Peters was the top scorer for North with 10 points and Samantha Taggart added nine. Taunton, 38 @ New Bedford, 28 – Final – Senior Alyssa Gibson led Taunton with 14 points, sophomore Hanna Moniz chipped in with eight points and senior Jordan Wade added six points for the Tigers. Mansfield, 3 vs. Lincoln-Sudbury, 3 – Final – Mansfield lost in a shootout for the tournament’s purpose but the game finishes as a tie in the MIAA standings. FRANKLIN, Mass. – Friday night’s contest between rivals Mansfield and Franklin wasn’t the exact same as their first meeting back in January, but the symmetry was apparent. Just like January’s game, the home team erased a second half double-digit deficit to make it a one possession in the final minutes. But just like the first time around, the visitors walked away with the win. Mansfield held off a late rally from the Panthers, keeping Franklin scoreless over the final final minutes, in route to a 55-51 win that pulled the Hornets level atop the Kelley-Rex division with just one league game to go. Th Hornets doubled their seven point lead at the midway point just five minutes into the second half and increased it to a game-high 15 points off a Christian Weber three to just 2:20 to play in the third, but Franklin wouldn’t go away. Over the course of the end of the third and the first few minutes of the fourth, the Panthers rattled off a 15-3 run to get the game down to one possession. Sophomore Connor Peterson closed the third with back to back baskets and freshman Jay Dieterle opened the final frame with a three. After Peterson hit a free throw to make it a seven point game, Mansfield’s Tyler Boulter drained a three to get it back to 10. For the next five minutes, Mansfield only managed one free throw as Franklin crawled back. Dieterle hit another three and after a stop, Peterson went into the paint for two more. Another missed three from the Hornets resulted in a strong take to the hoop from Dieterle to make it a three point game with 4:16 to go. Mansfield’s lone point came via Sam Goldberg’s free throw. After a steal from Tim Prunier, Sam Harrell took it to the whole strong to cut it to 53-51 with 3:09 left. The teams traded missed shots and on its next possession, Mansfield milked the shot clock down to the final seconds. With just a few tickets left, junior Matt Ehrlich took a step towards the basket from the three point line but instead of driving, pulled up for a deep two that he drained to make it 55-11 with 1:40 to go. Franklin missed on the other end but got a stop with just under a minute to go. Dieterle’s three was halfway down but rattled out and despite an offensive rebound, Franklin’s second attempt from three via Paul Mahon was off the mark. Franklin got another offensive rebound and called timeout but Prunier’s deep three hit the back rim. Mansfield missed it’s first free throw of a one and one but with a four point lead, elected to foul with 8.6 seconds left instead of letting the Panthers get a shot off from the floor. Both teams then traded missed free throws as the clock ran out. 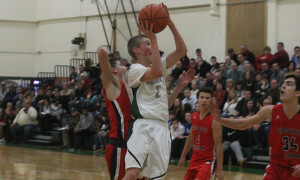 The win marked Mansfield’s fourth straight overall and seventh straight in league play. It was a back and forth opening quarter with each team holding leads. Franklin’s Josh Macchi converted a traditional play with 30 seconds to go to give the Panthers a lead but Mansfield’s Kyle Swansburg beat the shot clock while being fouled in the final seconds to put Mansfield up 16-15 after one. The Hornets gained some separation in the second quarter. With a one point lead at 21-20, Ehrlich scored five straight points for Mansfield and then Boulter connected on two three’s to give Mansfield a 32-25 lead at half. To start the third, Mansfield was able to stretch the lead to 10 and hold it around there for the majority of the frame. With an 11 point lead (43-32) with just over three minutes to play, Boulter connected on another triple and after Kevin Gill scored at the rim for Franklin, Weber knocked down an open three to make it 49-34. Boulter had a team-high 12 points while Sam Goldberg had 11 points, seven rebounds and three assists. Ehrlich (four rebounds, four assists) and Weber each had nine points, Nick Baskin had six and Max Boen had five points and four assists. Peterson had 21 points and nine rebounds to lead Franklin while Dieterle added 18 points and Gill had five points, six rebounds and five assists. Prunier added six rebounds and seven assists. “Basketball is a game of runs,” Vaughan said. “You’ve got to be able to play through the bad ones and capitalize on the good ones. I thought our third quarter was similar to their fourth quarter but we got some stops at the end. We had a cushion from the first half and then the third quarter was ours, the fourth quarter was theirs but in the final two minutes we got the stops to close it out. Mansfield boys basketball (14-4, 12-3) will host Weymouth on Monday night. It will have a chance to clinch its fourth straight Kelley-Rex crown against Attleboro on February 22nd. Franklin (14-3, 12-3) will take on Everett on Sunday evening in Woburn. The Panthers can clinch a share of the Kelley-Rex with a win over North Attleboro on February 22nd. MANSFIELD, Mass. – Milford came out firing with a 10-2 run. Unfortunately for the Scarlet Hawks, it was the next big run that would decide the game. Mansfield responded with dominating play, outscoring Milford 50-13 over the next two and a half quarters to come away with a 57-33 victory. Milford began the game shooting well, hitting their first four shots. The Scarlet Hawks began the game playing aggressive defense which gave Mansfield little room to work. After consecutive threes from Dwight Anderson (11 points) and Zack Tamagni, the Scarlet Hawks found themselves with an early eight point lead. With their backs against the wall, the Hornets looked to juniors Matt Ehrlich and Phil Vigeant to carry them out of the hole. The two combined for the Hornets’ next seven points and in the blink of an eye the Milford lead was all but erased. Anderson hit two big threes as the quarter carried on, keeping the Scarlet Hawks within striking distance. In the closing seconds of the quarter Kyle Swansburg hit a momentum building layup while getting fouled to set up a five point possession for the Hornets. Swansburg’s free throw attempt missed allowing and Christian Weber grabbed the loose ball and hit an open three to give the Hornets a 22-16 lead after the first quarter. “When we got deeper into some possessions, moved the ball, and just stuck with what we do, shots started to fall for us,” Mansfield coach Mike Vaughan said. Mansfield owned the second quarter, outscoring Milford 14-3 in the frame. It was stellar team play that led to the Hornets finding ways to break through the stout Milford defense. Mansfield facilitated the ball around the court at a rapid pace forcing Milford’s defense to overcommit and become out of position. 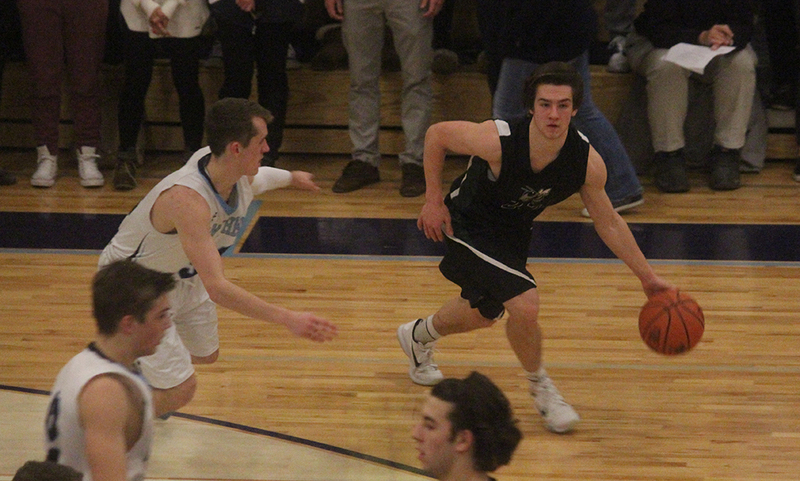 The Hornets exploited the holes in Milford’s defense with accurate outside shooting led by Ehrlich (team high 11 points), who contributed seven second quarter points. Baskets from Tyler Boulter and Sam Goldberg extended the Hornets lead into double digits as they entered halftime leading 36-19. “I thought Matt played really well early and in the second half some other guys stepped in and did some good things,” Vaughan commented. Consistency was the key for Mansfield tonight as they started the second half right where they left off as four different Hornets scored to begin the third quarter. Milford battled to get open looks on offense but could not seem to find their stroke. Mansfield took care of the boards, led by Hornet big man Sam Goldberg (10 points, 9 rebounds). “We’ve been trying to be more consistent as the second half of the season carries on, and I thought we did a pretty good job on both ends of the floor,” Vaughan added. Milford managed to keep the Hornet offense at bay in the fourth quarter but unfortunately for the Scarlet Hawks it was too little too late as the Hornets rolled to a 57-33 victory. With tonight’s win Mansfield officially qualified for the state tournament. Mansfield (11-4) will look to continue playing their best basketball on Friday night against Taunton (12-3) in a game that will have major implications on the Kelley Rex division title race. Milford (5-9) will look to get back to their winning ways as they travel to division leader Foxboro (12-3) on Friday night. FOXBORO, Mass. – Foxboro had a game plan that they wanted to execute early: get the ball to senior 6’4 center Rob Lowey. They were able to do that to get some high percentage looks and that opened up space for everyone else. After an 11-0 run in the first quarter to gain the lead, the Warriors never relinquished it in a 69-51 win over Mansfield. The win marked the first time a Davenport division team has beat the Hornets since the Hockomock League split into two divisions back in 2010. It marked the first time that Mansfield has lost back to back games since February 2012 (loss to King Philip and Brockton). “We always want to establish Lowey on the inside, on any night,” Foxboro head coach Jon Gibbs said. “He’s obviously a big time player for us and it’s a way for us to get high percentage shots but this game in particular, we knew Mansfield likes to play behind in the post, they don’t do anything to deny the pass into the post so we felt we could get it into him and we did and he produced. It’s great to see him to kind of put the team on his back and carry us. Lowey scored seven of Foxboro’s nine points but after a Nick Baskin three, the Warriors trailed 12-9. That’s when Foxboro embarked on a big run with two buckets from Procaccini, one from Lowey and then five straight points from DuBrow to take a 20-12 lead after one. The Hornets had an 8-2 run to start the second quarter and stayed within four with a three from Max Boen and a bucket from Kyle Swansburg but a late layup from DuBrow sent the Warriors into the locker room with a 29-23 edge. A 7-0 spurt a little over the halfway point of the third quarter – with a bucket from Lowey and five more from DuBrow – lifted the Warriors’ lead to 13. 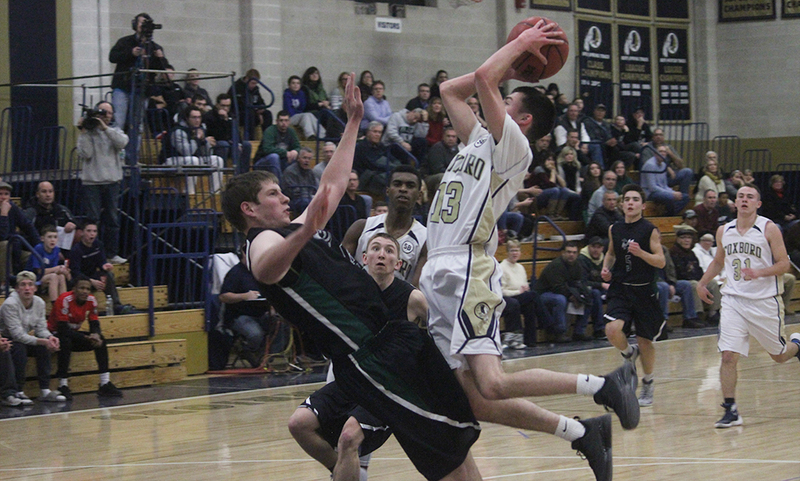 Mansfield kept the deficit around the same but layup from Andrew Block and then a corner three from Joe Morrison just before the buzzer gave Foxboro a 52-37 lead going into the final frame. Coming into the game, Foxboro had allowed a league-low 47.7 points per game. In the final quarter, Foxboro’s lead was never less than 14 points. Mansfield finished with 13 turnovers and shot under 20% from beyond the arc. “We did not play Mansfield basketball on a consistent basis,” Mansfield head coach Mike Vaughan said. “I thought in the first couple of minutes, I thought we were in a nice rhythm and following the game plan defensively. I didn’t expect to come in here and blow them out so when it was a one point game early, that’s what I anticipated it would be throughout the game. But the vintage, 2016 Hornets showed themselves for a few minutes. If we’re going to keep our supremacy in this league, we’re going to have to fix that stuff. We’re going to have to weather storms and be able to execute game plans. Foxboro’s a good team, Jon does a great job and they were well prepared on both ends of the floor. Foxboro also stressed the importance of taking the time to execute their game plan, especially on the offensive end. DuBrow had a game-high 22 points and eight rebounds while Lowey had 16 points and eight boards. Procaccini had 14 points, five rebounds and three assists. The Warriors as a team had a 35-14 edge in rebounding. Foxboro (8-2, 6-2) will be back in action on Friday when they host Canton. Mansfield (6-3, 5-3) will look to snap their two game skid when they take a trip to King Philip, winners of four straight. MANSFIELD, Mass. – On a night where Mansfield only had one player score in double digits, the Hornets were still able to get the victory due to their emphasis on team play. The Hornets played swarming defense all night and ‘ used a balanced attack on offense to get a 61-43 win. The game started slow as both teams struggled to find their touch. North Attleboro senior Kyle Gaumond opened the game with a three pointer as the Rocketeers took the early lead. The game carried on for another three and a half minutes before Mansfield finally found the net with a layup from Phil Vigeant. North’s Brent Doherty hit another three later in the quarter to give North a 9-8 lead at the end of the first quarter. Acknowledging the sluggish start, Mansfield head coach Mike Vaughan felt it was his defense that held his team together early. “We did a great job defensively keeping things where we needed it until we found a way to take shots,” Vaughan said. Both teams found their stride as the second quarter started. The Hornets came out hot with baskets from senior Kyle Swansburg, junior Max Boen and Vigeant to capture an early five-point lead. 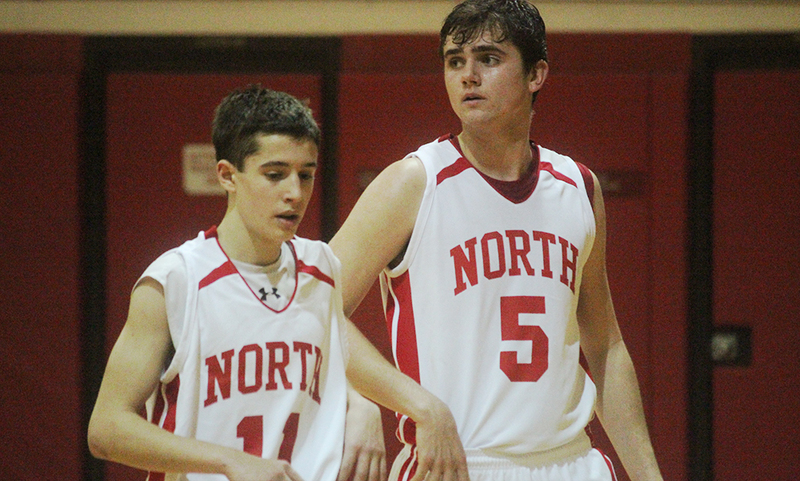 North Attleboro answered right back with four points from senior Ridge Olsen as the Mansfield lead was cut to one. After trading several baskets, the half ended with a crafty buzzer-beating floater from, Doherty who led the Rocketeers with 17 points. Although trailing by two entering the half, Big Red’s defense looked strong and used variety in their defensive schemes to hold the stout hornet offense to only 23 points. Unfortunately for the Rocketeers, it was the tale of two halves. Swansburg led the charge out of halftime with a free throw, a rebound down the other end of the court followed up by layup on the offensive side of the ball. It was the big men down low who played a major role in the Hornets’ success on both sides of the ball. Swansburg and Sam Goldberg combined for 13 points and nine rebounds on the night. The two players were relentless below the basket and made it difficult for North to work the ball down low. Vaughan described them as a “nice combo,” indicating the two complement each other nicely. MANSFIELD, Mass. – In a highly anticipated matchup between two of the top teams in Division 1 South, Mansfield used a very strong first half and made a statement in a 72-34 rout of Bridgewater-Raynham on Thursday afternoon. So just how good was Mansfield’s first half? If the Hornets didn’t score in the second half, they still would have won the game by nine points. “I think that just goes to show how tuned in we were in the first quarter and the first half,” Mansfield head coach Mike Vaughan said. “I thought we forced them to have to gamble a bit and we’re not an easy team to gamble against because we throw the ball around and use the whole floor so to try and defend 50×50 is not easy. After leading 20-9 at the end of the first quarter, Mansfield took a 43-16 lead into the halftime break over the Trojans, who were without star player Terrel Williams. The Trojans cut the deficit to four with 1:24 left to play but that would be the closest they would get for the rest of the game. Matt Ehrlich responded with a three pointer on the other end and the Hornets finished the quarter on a 7-0 run. To start the second, things continued to go Mansfield’s way. Three free throws, another three from Ehrlich, two from Sam Goldberg, two from Phil Vigeant, two from Max Boen, and three more from Vigeant capped a 15-0 run to start the quarter and extended Mansfield’s overall run to 22-0. The Trojans finally scored their first points of the quarter with 2:30 left to go. Mansfield capped the first half with a traditional three point play from Tyler Boulter. More ball movement, extra passes and movement off the ball meant more points for the Hornets in the third quarter. Former Taunton forward EJ Dambreville, now playing for B-R, drained two free throws to get the Trojans to 20 points. After that, Mansfield rattled off a 10-0 run over the next three and a half minutes. Five points from Boulter, three from Vigeant, two from Goldberg help to extend Mansfield’s lead to 40 (62-22) at the end of the third quarter. The fourth quarter was B-R’s best offensive quarter, scoring in double figures (12) but it was far too late. Williams, who is the leader scorer for the Trojans, was not in uniform. “He makes a big difference, I don’t know if it’s the score difference,” Vaughan said. “I think he’s a special player and we were kind of disappointed we didn’t get the chance but if we see them down the road in the tournament we might get a chance. We like to play teams at full strength. We put B-R on the schedule knowing they’re a quality team and they’ll play hard and bring a great energy and effort. Goldberg had 13 points and nine rebounds, Vigeant had 13 points, five rebounds and three assists and Ehrlich had 13 points and five rebounds. Kyle Swansburg added nine points for the Hornets. Mansfield improves to 4-0 overall and have won 17 straight at home. The Hornets will put that streak on the line when they host North Attleboro (1-2) on Monday at 6:30. Attleboro, 66 vs. Dartmouth, 63 – Final – Attleboro built a 15 point lead at halftime but had to hold off a late fourth quarter charge from Dartmouth to get the win. Jake Dunkley had a game-high 21 points, Andrew Milliken added 16 points and Lucas Boucicaut chipped in with 12 points. King Philip, 38 @ LaSalle Academy, 41 – Final – The Warriors had a chance to tie it at the end but were unable to get the shot to fall. 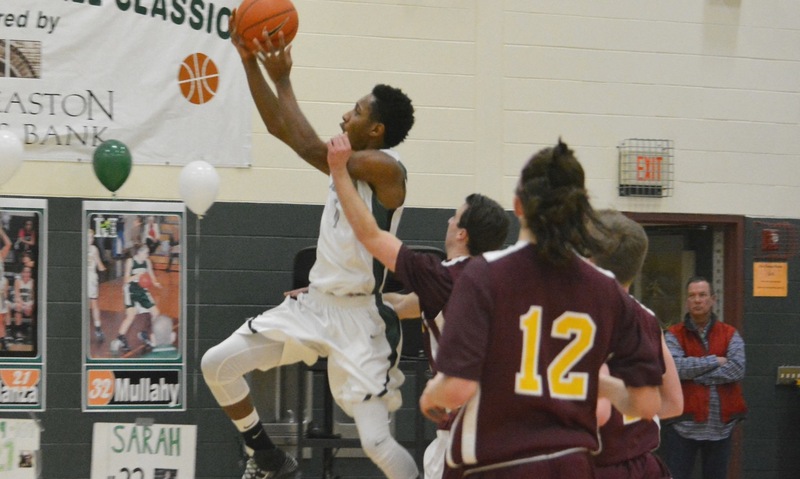 Junior Pharaoh Davis had nine points for King Philip. Mansfield, 72 vs. Bridgewater-Raynham, 34 –Final – Sam Goldberg had 13 points and nine rebounds, Phil Vigeant had 13 points, five rebounds and three assists and Matt Ehrlich had 13 points and five rebounds. Kyle Swansburg added nine points and Nick Baskin had seven points in his first game of the season. After winning just three games a season ago, the Bombardiers will be looking to make a push back to the postseason in 2015-2016. One big reason that Big Blue has high hopes for this season is a healthy Kyle Murphy. The 6’3 senior missed over half the season last year with an injury but looks primed to be a leader for the Bombardiers this season. When he’s on the court, Attleboro will have the rebounding advantage and he’s able to convert in the paint to help the offense. Head coach Mark Houle will also have junior Andrew Milliken back this season, who has the ability to attack the rim and find success at the hoop. Houle said the 6’2 forward has improved his shooting range, which will help Attleboro spread the floor some. Jake Dunkley is another shooter that will help Attleboro while point guard Lucas Boucicaut is back with an improved skill set. Along with Milliken and Murphy, Houle has 6’3 forward Berlyns Abraham as another presence in the paint. The Panthers were close to returning to the D1 Central Sectional Final last year but with four of the starters from that team graduated, there will be plenty of minutes to be had this season. Senior point guard Tim Prunier, who is one of the top players in the entire league, is the lone starter returning while forward Josh Macchi, who saw got some experience coming off the bench last year is also back. But just because names like Marcus Giese, Dylan Reno, Markus Bohmiller and Shawn Hanley are gone doesn’t mean the Panthers won’t be competitive this year. In fact, Franklin will likely be in the thick of the Kelley-Rex division race. There will be plenty of new faces but they almost all have good size and can shoot the ball, two traits that will make Franklin a tough opponent. And unsurprisingly, the Panthers will likely be one of the top defensive teams. In the first year with Matt Coute at the helm, the Warriors made it back to the postseason after a two year hiatus. Now Coute will have a different looking squad with better outside shooting and a reliance on sound defense. Senior Ben Smith and juniors Noah Goodwin and Will Weir will be the most experienced players for a young King Philip team. The Warriors know they could play the underdog role a bit more this season and that’s something they’re relishing. And while the Warriors might not have a ton of experience, there is still plenty of talent amongst the younger players. Freshman Kyle Layman will look to make an immediate impact while sophomore transfer Pharaoh Davis and sophomore Tom Madden could see plenty of minutes this season. Over each of the past couple of seasons, the Hornets have had to deal with lots of turnover, including losing league MVPs, many all stars and plenty of other great players. Yet still, the Hornets have reached the D1 State Final, the D1 South Semifinal and the D1 South Finals in the last three years. That run will be tested this year as once again Mansfield graduated a ton of talent, including Hockomock League MVP Ryan Boulter and HockomockSports.com Player of the Year Michael Boen. But at the same time, head coach Mike Vaughan will be returning plenty of players that have a good amount of varsity experience. Senior Nick Baskin and junior Math Ehrlich are both starting their third varsity season and along with seniors Kyle Swansburg and John Gouvalaris will be relied on to be the leaders for the Hornets this season. Meanwhile, players like juniors Christian Weber, Sam Goldberg, Phil Vigeant and Max Boen all saw plenty of minutes of the past season and will try to fit into the rotation. “Trying to replace guys like Boen and Boulter will be difficult, but I think we will do it by committee,” Vaughan said. “This is one of the deeper teams I have had where every guy can play and does things well. We will see different guys lead us each night. Expectations are high in Big Red country and for good reason. The Rocketeers have nearly everyone back from last year’s team and despite that team only winning five games, they were one of the few teams that were better than their record. Junior Brent Doherty had a breakout campaign during his second season on varsity last year and could be one of the top players in the entire league this season. Doherty, a point guard, is mighty quick and despite only being 5’9, is able to slice through defenses to get to the rim. Sophomore Chad Peterson, a strong player who can shoot from the perimeter, will be looking to follow up on a strong rookie campaign and senior Kyle Gaumond that has good range on his shot and will be one of the Rocketeers top defenders this season. On top of that, senior Ridge Olsen is one of the most experienced players in the league while Thomas Reynolds, Jonny Friberg and Kyle McCarthy all saw good minutes last year. After making it to the D1 South Sectional Semifinal last season, the Tigers will be looking to make another postseason run this year. Senior Jose Mercado and junior Tommy MacLean, two of Taunton’s players last season, are back to run things for head coach Charlie Dacey this season. The biggest question will be who fills the void left by Corey Green’s graduation. Mercado showed last season he can shoot as well as be a successful player in the post, both offensively and defensively. MacLean has improved each of the past two seasons and could make a big jump with more responsibility in his junior year. Taunton will rely on players like Quandarius Roberson, who transferred in back from prep school, Carlos Borrero, Lens Esquil and other younger players to complement Mercado and MacLean. With the athletes that Taunton has, expect the Tigers to get out and run.